After my frustration with the stethoscope experiment mentioned in my last blog post, Ben suggested several other methods of sourcing sounds to consider. 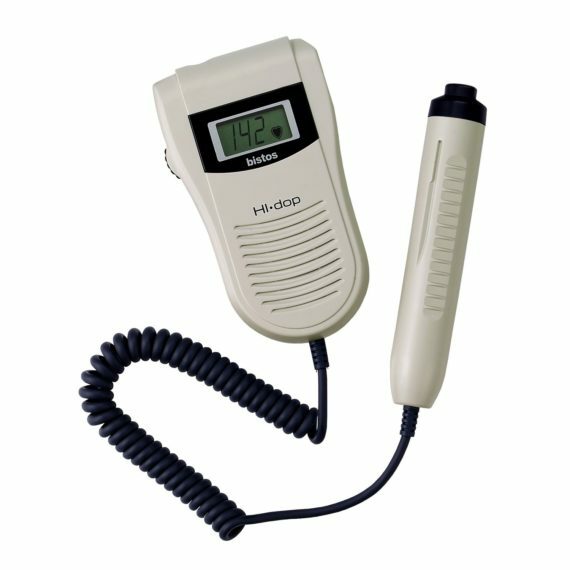 The first suggestion that I tested out was to hire a Doppler fetal monitor, which is a piece of medical equipment that generates sound as it monitors the movement of body fluids and their velocity within the body. Typically a Doppler is used to monitor the heartbeat of a baby in utero during pregnancy, but it was my hope that it would capture sounds related to the movement of blood within my body. I was surprised to see that you can hire this technology – intended to be used by expectant mothers or midwives and doctors. The lub-dub that I heard through a stethoscope was mesmerising, but it is a sound that we are all familiar with. We have all, at some point heard the pulse of the heart beating – whether by placing an ear against someone’s chest or hearing the pounding of your heart in your ears after physical exertion. With this in mind, it was really surprising to hear the sounds produced by the Doppler on monitoring the blood pumping through the valves of my heart. The rhythmic high pitched squelchy sound was very visceral and seemed to create an image in the mind of how fluid the pathways within the body are actually constantly in motion – never still or stagnant whilst we are living. I was surprised to hear how much the sound changed by slightly moving the probe – collecting sound from various angles. I thought about how privileged I was to be able to experience the body in this way. We often don’t encounter these types of sounds or experiences of the body unless there is something wrong with our health, or during pregnancy. But even in these circumstances there is a medical professional in control of the equipment and we take on the role of the passive patient. To be able to access medical equipment and to use it as a method of exploration of the body is a powerful experience which brings to the surface the hidden activity of the world within. I begin to wonder what other medical technology could produce in relation to explorations of the body, not for diagnosis, but for artistic research. I have previously been hesitant about collecting sounds from outside of the body, but actually the Doppler is capturing a sound that I would never be able to experience – the sound of blood flow. For the gritty “Out of the Furnace,” released in December, the film’s sound-effects designers wanted Casey Affleck’s brutal fist fights to have visceral, fist-on-flesh punch sounds. They recorded a martial artist pounding on human flesh but also had him punch blobs of pizza dough, a slab of beef with a wet towel on it, a watermelon, and—to simulate the sound of bones cracking—dry pasta shells. I suppose the question I need to consider is where the importance of the sound lies within my work – Is it about the sound and how it affects the audience? Or, is it about investigating body directly? Even if that means that the desired sound is not possible, but the place of the body within the work is authentic? I need to also remind myself of my starting point with this work – that I wanted to explore what my body may say when I use different technologies to give it space to speak. I need to remember that it is important to chase the unknown… that if I am trying to produce a specific sound in mind, then there is nothing to gain from that; no space to grow. It is through allowing the technology and the exploration to lead me that new things will be discovered, widening the dialogue uncovered. Going back to my experiments with the Doppler, the sound produced was heavily distorted – the speaker on the doppler is obviously made for medical functionality to count the heart beats and not for good sound quality to be shared in an immersive art experience! I took the Doppler to my mentoring session with Ben and we plugged it into a large speaker. To hear the sound without the rattling of the Doppler speaker was so exciting. It felt so immersive and confronting – the abject nature of the sound was unavoidable. I felt bathed in this strange sound that felt both familiar and unfamiliar at the same time. I realised that in fact – I didn’t necessarily need to alter the sound, that it could in fact exist as a live work. To bring to the surface the inner workings of the body, and to share that on a large scale would be a really interesting experience. The Doppler does carry some strange background sounds as it picks up different frequencies. I’m not sure how, but at one point whilst experimenting with the Doppler in Ben’s studio, as we sat listening to the sounds from within my chest a faint sound of a man’s voice began to emerge. It wasn’t clear enough to hear the words he was saying but there was definitely a male voice speaking. It was actually quite spooky! It reminded me of the strange sort of equipment that paranormal investigators use when on ghost hunts! (I love the irony of those TV shows and how they employ empirical scientific equipment to ‘prove’ the existence of metaphysical activity / beings – metaphysical being beyond the empirical, behind the physical and therefore unscientific!). I can’t help but wish that the sound of the Doppler functioning wasn’t there, but in a way it is an authentic part of the process – an amalgamation of the sounds of my body working and the machine working. To remove these sounds would give the audio a cleaner aesthetic, but it could be considered to be an attempt to trick the listener into not hearing the technology – without which the sound would not exist. It’s complicated, and I don’t know what I think or how I feel about it yet. Thinking about the visceral sounds of the blood flow, I wonder whether these inner body sounds are stored as a memories buried deep deep within our mind and our body, captured from the last and only time that we existed within a body of another… our mother. I wonder whether feeling these sounds trigger the memory stored within, initiating the visceral physical reaction that occurs when we experience such sounds in space through the cells of our body – a primal memory of the sound of our origin. The more I record and collect these sounds the more I understand my intrigue in them. Hearing the squelchy fluid sound of the blood being pumped through the valves of my heart through the tinny speakers of my laptop is a disappointment – particularly after hearing the sound through Ben’s speaker. This experience has led me to realise that I think the true power of these sounds will only be realised when encountered very loudly in space, opposed to loudly on headphones. I realise that my interest in sound – particularly these visceral sounds is the physicality of them. They are sounds which I believe will be most affective when felt, not just heard.